Large George Best hand signed Fuji archive photograph of George running at Everton’s defence, watched on by Alan Ball during the F.A Cup sixth round tie on the 1st of March 1969. Double mounted in white over red and finished with an engraved plaque and a black contemporary frame. 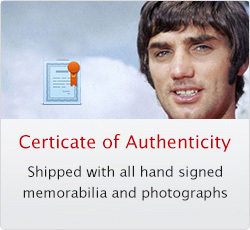 This item is supplied with our GeorgeBestOfficial Certificate of Authenticity which includes an image of George signing the photograph and the date and location of the signing.